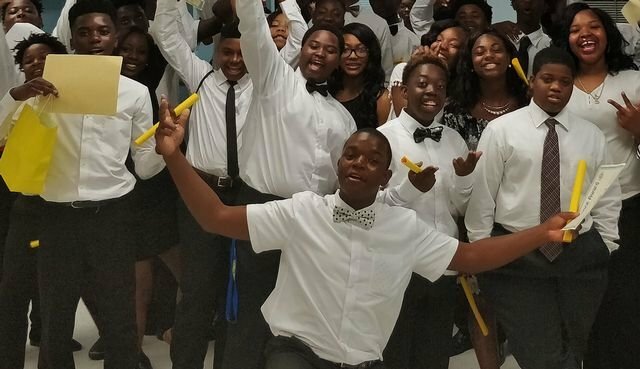 Aliceville Middle School: Highlights - AMS 8th Grade Graduation!!! We held our annual 8th grade graduation honoring our 2017-2018 class Wednesday, 5/16/2018. We would like to take this moment to congratulate these students on reaching this milestone in their lives. We hope you have enjoyed your time here at AMS as much as we have enjoyed having you here. We hope that you leave AMS feeling prepared for, and excited about, the opportunity to continue building your futures through the continuation of your education at AHS. Out of selfishness, we also hope that you leave AMS with a tinge of sadness, ensuring you will never forget us. Just remember, we will always be here for you and you will be missed. As you continue down your path towards adulthood, we hope you will look back fondly on your time spent at AMS, while also recognizing the important educational foundation that was built here. We wish you continued success in all of your pursuits! So, AMS class of 2018 (AHS class of 2022), CONGRATULATIONS!!! Be proud, you’ve earned it.